This report presents all positive and negative aspects of TOFD method and examples of its recent applications. It depicts and explains the TOFD mathematical model and shows the experimental results which obtained by the SOFRA-Xscanner using 2x10 MHz angle probes in the Centre for Automated and Robotic NDT at South Bank University. It also presents Automated TOFD data produced by the IBM 7545 robot arm and compares its result with the data obtained by the Manual system. The Time of Flight Diffraction (TOFD) ultrasonic testing method is relatively new and was first developed at Harwell laboratory in the late 1977's by Maurice Silk (1). TOFD testing has been gaining in profile over the last three or four years with much interest focussing on whether or not it can be used to replace more established NDT methods . Recent survey shows that the annual average growth rate (AAGR) of the TOFD market is 10-20% higher than other NDT technique . The TOFD method is gaining and increasing popularity because of its high probability of detection, low false call rate, portability and most important its intrinsic accuracy in flaw sizing, especially in depth. There is another NDT method called radiography testing (RT/ X-ray) usually employed for flaw sizing. It should be noted that RT/X-ray technique shows better accuracy for lateral flaw sizing but it demonstrates insufficient accuracy in depth assessment. As the standards for radiation safety become tighter by the new European law, many NDT companies, for example RTD, OIS plc, Shaw QED, Northern NDT and Torch Quality Services (TQS) are trying to substitute X-ray technique by TOFD technique for cost effectiveness and mostly for safety and environment protection reasons. However, there are many limitations in this new TOFD technique which is discussed in the next chapter of this report. And there are also positive and negative comments from the panel discussion of " Ultrasonic Session III " . This report also mentioned the recent applications of the TOFD technique and showed a number of companies are already implementing the TOFD method instead of Radiography method [13,14,15,16]. It explains detail of the TOFD mathematical model in Fig (2) and sets up the necessaries formulas to calculate the size and depth of the defects, thickness of the steel plates and their arrival times. End of this report compares the Automated and Manual TOFD's experimental results which are achieved in the Centre of Automated and Robotic NDT at South Bank University. The most significant distinction between TOFD and the other UT methods is that it monitors only forward-scattered diffracted energies from the tips of defects rather than reflected ultrasonic energies. Two wide beam angle probes are used in transmitter-receiver mode. Broad beam probes are used so that the entire crack area is flooded with ultrasound and, consequently, the entire volume is inspected using a single scan pass along the inspection line. Because the technique relies on detection of the forward scattered diffracted signals originating at the flaw edges, precise measurement of flaw size, location, and orientation is possible. The TOFD method only evaluates diffracted echoes, which are 20dB less than the reflected echoes. Diffracted waves have a different velocity than reflected longitudinal waves. Diffraction is stronger for longitudinal waves than for shear waves. The standard is the use of longitudinal probes, 50 to 70 degree, small crystal, with widely spread sound beam to cover the whole defect. The two diffracted signals of the crack tip are generated with a 180-degree phase shift. The distance between the two signals on the time scale is nonlinear. TOFD always uses RF signals to display images, (minus = black, plus = white), although colors could be used. Images showing arcs which shapes can be used to illustrated the geometry of the flaw. Fig 1: The basic setup of TOFD testing is shown on Fig.1 a-c.
Two ultrasonic angles probe, 30-70 degree longitudinal wedges, minimum 5 MHz. Test object (except coarse grain materials), minimum thickness is 6mm with diameter of 4 inches. Personal computer and data acquisition software. The two ultrasonic angle probes are used in the TOFD experiment. One is transmitter (T) and another one is receiver(R). They are placed on the same surface of the test object Fig (1-a). The distance of the probes is calculated according to the wall thickness. See equation (8). The lateral wave (1) runs along the surface, the back wall echo (4) reflects the bottom surface of the test object and reach to the receiver. The other two signals, upper flaw tip diffracted signal (2) and lower flaw tip diffracted signal (3) appear due to inhomogeneity. Fig (1-b) shows the A-scan and the time delay for each signal. The horizontal axis measures the time of flight and the vertical axis measures the amplitude. The signal (1) is the lateral wave, signal (2) & (3) are the diffracted signals top and bottom respectively and the final signal (4) is from the back wall echo. Fig 1-c shows the B-scan image generated by horizontal probe movement and time of flight in a vertical direction . The echo amplitude is displayed as gray scale, usually zero amplitude light gray (negative maximum amplitude black, positive maximum amplitude white). For defect testing it is important to notice that the probes are aligned transversal to the defect, while the image is generated in the direction of the defect. That means the image projection of Fig 1-c stands perpendicular to the probe projection shown in Fig 1(b). The TOFD technique is based on timing measurements made on the signals diffracted by the crack. The general situation is depicted in Fig 2. The transmitting transducer T emits a short burst of ultrasound into the steel plate which thickness is H mm. This energy spreads out as it propagates into a beam with some definite angular variation. Some of the energy is incident on the crack tip (O & O') and is scattered by it. Scattering from the edge of the cracks, called diffraction, causes some fraction of the incident energy to travel towards the receiving transducer R.
If the crack is big enough then the signals from the two extremities of the crack will be time-resolved. As well as these two signals, there will be some energy which arrives at the receiver directly from the transducer by the shortest possible path (L1+L2) and (L3+ L4)- just below the surface of the component and an echo from the back wall. Such a set of actual signals is displayed in the lower part of Fig. 2. In the example, the transducers were moved, at constant separation, in the vertical plane, over a defect perpendicular to that plane. The signals appearing are, from the top of the figure to the bottom, the lateral wave, signals from the top crack (O) and bottom crack (O') of the defect and finally the back wall echo. AOB is right-angled triangle and OA perpendicular to the surface AB. OB = L2, OA = D and AB = S/2 (half of the probes separation). L2 - Half of the path of the diffracted signal so it takes time t1/2. S/2 - Half distance of the probes separation. t1 - The arrival time of the top tip diffracted signal. The third arrival time from the bottom tip diffracted signal to the receiver. The basic principle is the same as described above, the only change need to be done O`A instead of OA. The fourth arrival time from the back wall echo to the receiver. Where C is the speed of the lateral wave. On a flat plate this speed is identical to longitudinal wave. From the experiment result of the A-scan in Fig (3), can easily be measured the delay time of the lateral and diffracted signals. Each division is divided in to 10mm and each millimeter is 0.75micro-second.The time of the diffracted and lateral signals are calculated in table (3). As we know the arrival time of the diffracted signal (t1), probe separation and speed of the sound from the table (1). We easily can calculate the size of the depth by using the equation (5). The calculation shows the depth D = 9.1 mm which is almost the same value of the actual depth. The result obtained the 90% of its accuracy. Due to lack of test specimen we are unable to do more experiment at the moment. But in future we are expecting to do more TOFD experiments using different thickness of the metal with various defect sizes and orientations. As we requested SOFRATEST Company to provide us more test specimens, hopefully, we will be able to prove that TOFD method has the higher accuracy than any other NDT methods. 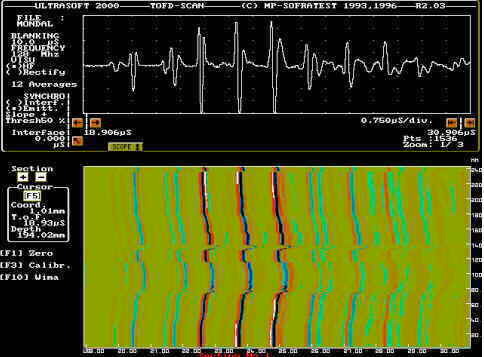 TOFD defect detection does not depend on the defect orientation, in contrast to the pulse echo technique. Defect height can be exactly determined, thus most suitable for monitoring growth or changes in known defects. The inspection results are immediately available, as is a permanent record. Because of the high-test speed the costs are less than those for radiography for wall thickness above 25 mm. It possible to perform scans with a speed of hundreds of millimetre per second. TOFD save costs, if applied during construction, since it is possible to distinguish pre-service and in-service defects. That means the unit can stay longer in production, and is safe. High probability of defect detection . Most efficient for inspection of thick-walled vessels where X & Gamma ray would require too much time. TOFD method can be used to observe and report microscopic degradation caused by fatigue, stress and chemical attack - it has proven possible to quantify micro cracking caused by copper dilation through weld electrode contamination providing some knowledge of the probable fault mechanism is suspected prior to intervention . TOFD can be used in high temperature environment (up to 250 degrees C). The entire volume can be inspected using a single uni-axial pass along the length of the weld. TOFD is safe for environment protection reasons due to free radiation. Sensitivity level: If the instrument sensitivity (gain) is set on very low level, the TOFD image would display no diffracted echo. 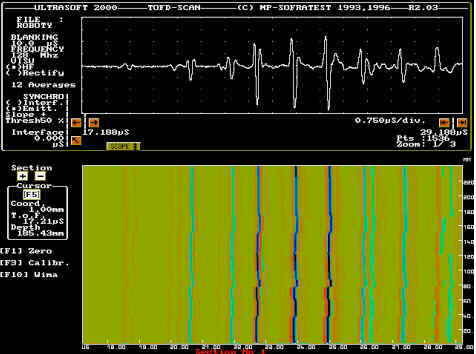 If the instrument sensitivity is set just above electronic noise level, the TOFD image will display a lot of diffracted echoes which are caused by very small inhomogeneities of the weld seam and does not mean that the weld is really bad. Crack size determination: In practice, diffracted echoes at crack tips are not so clear as they are displayed in Fig 1b & 1c. Crack tip echoes are part of a noise area caused by other relevant diffracted echoes of inhomogeneity. That can make sizing with the TOFD technique impossible. A TOFD image inspector needs to perform depiction decisions similar to that used in radiography. Detection of small cracks at backside: This is one of the main disadvantages of TOFD. For in-service inspection of welds it is usually not so important to find old defects inside the weld seam. More important is the detection of cracks at the backside of containers or piping. The use of diffracted echoes is for that task is not possible. So close to the back wall the crack tip echo amplitude is very small. In that case traditional UT techniques with angle beam probes and use of the mirror effect must be applied. The TOFD technique is not applicable here. A disadvantage of TOFD is that the gain must be very high, which produces a very high back wall echo and it is not suitable for coarse grained materials. The probe frequency should be 10 MHz or higher, frequencies under 5 MHz are not applicable. Crack edges must be sharp, and they are not always. There is a dead zone for defect detection under the surface. It means, defects close to the surface could not be detected. This may be compensated by MPT (Magnetic Particle Test) or test with creeping wave probe. Minimum thickness requirement is 6mm with diameter of 4". No limitation on maximum thickness, it could be several hundreds mili-meters. Cannot be applied on coarse-grain weldment e.g. austenitic stainless steel and Inconel. TOFD is not effective at detecting and sizing defect lying parallel to the inspection surface. TOFD cannot resolve 'included' defects such as fabrication induced slag and porosity. The problem is the angle of the crack cannot always be assumed to be vertical. The angle of the crack might have a great effect on the magnitude of return signals. Companies like Exxon, Shell, Fluor Daniel, Texaco, Chevron etc. are using TOFD to replace radiography in examination of welds after the final heat treatment. PS(probe seperation) can cause a profound change in the experimental result. DZ(Depth zone) for each range of thickness an appropriate value shall be established and validated on test block. Probe angle, crystal diameter and test block. Quality control of pressure vessel fabrication and piping construction, e.g. Reactors, Spherical Tanks, etc. Periodic inspection of pressure vessels which do not facilitate entry due to presence of catalyst, internal lining or unavailability of shut-down window. The technique can be applied on hemispherical components and nozzle-shell/bead welds. In more recent years the expertise has been adapted for non nuclear applications including vessels for the chemical / process industries , complex forgings and castings (eg turbine discs) and nodal configurations on tubular structures. A platform in the North Sea was inspected for underwater welds of a repaired construction with a speed of 45 minutes for each. A radiography would need 16 to 29 hours. In West Java 2000 m welds on 8 gas containers, the test was carried out at a very high speed. Every day 60-100 m of welds were tested with TOFD. A report of the Netherlands welding institute (NIL) documented a higher probability of detection and lower test costs for the TOFD technique than other NDT methods. According to this report , TOFD is twice as reliable than manual UT and by 1.3 more reliable than Radiography. BRITE EURAM II project ' NDT methods for flaw detection during welding' at Nordon and CIE's workshops in Nancy, France. The aim of the project was to demonstrate NDT using TOFD whilst welding was taking place - i.e. the ultrasonic probes were to be placed a short distance behind the weld torch . In many instances, use of automatic TOFD inspection has a great advantage where require higher POD, greater accuracy, more measurements, faster procedures and elimination of human involvement. Manual test may introduce many errors, because measurements are taken once, at a single time. Automatic TOFD may offer a solution by taking multiple readings and averaging results; errors are reduced and may even be eliminated. Also automated TOFD is a faster procedure where measurements entail complicated setting up, triggering, result interrogation and evaluation procedures manual measurement systems are inevitably slow. Human involvement means these processes must be undertaken at human speed; automatic TOFD system on the other hand, can perform some procedures much faster. Using Manual system it is very difficult to maintain the constant speed and the constant force contact, where the surfaces are not smooth. Due to variable speed and non-constant force contact, in many cases, using Manual system it is impossible to scan the rug (non-smooth) surfaces properly. Automated system, on the other hand can perform better scan in the same surfaces due to their constant speed and constant force contact. The Automated and Manual experimental results on the rug surface are shown in Fig 3(a) and Fig 3(b) respectively. These both experiments are carried out in the Centre for Automated and Robotic NDT at South Bank University. The purpose of the experiment is to compare the results between Automated and Manual TOFD scan on the non-smooth surfaces and their effects on B scan images. The test specimen is two layers (steel and rubber) with no defects. The surface was rug (non-smooth). The size of the test specimen is 300 x 300 mm and the height is 10 mm. Automated TOFD scan is carried out by using IBM 7545 robot arm. IBM 7545 is a PC controlled based programmable versatile tasks performing robot arm. TOFD SOFRA-Xscanner is attached with its end-effector and is programmed the robot arm to move the Xscanner straight line with constant speed 3 mm/sec on the rug surface of the test specimen. The maximum speed of the TOFD Xscanner is also 3 mm/sec. A speed alarm signal will be output when the Xscanner speed will exceed the acquisition capacity of the system. The Xscanner is connected with the encoder Board PCCDO2. The PCCDO2 board can read 2 axis encoders. The display shows individual bytes and total pulses count. The total count displayed for one revolution will be 4 times the number of cycles set in configuration function, due to quadrate decoding. The position in millimeters is then displayed, according to the developed length set in configuration. Manual system is carried out on the same rug (non-smooth) surface of the test specimen. The experimental set up was almost same the automated system. The only different was moved the Xscanner manually instead of the robot arm. During the experiment the speed alarm was warned many times due to variable hand speed. These variable speeds have been effected on the data acquisition system. The experimental result is shown in Fig 3(b). As we can see from the above Fig 3(a) and Fig 3(b) that the automated system can be used for the better scan than the manual system. The poor resolution in the manual system, most probably due to shaking hand while moving, override the Xscanner and non-constant force on the rug surface. Dr. Maurice Silk, " The potential of scattered or diffracted ultrasound in the determination of crack depth", Research techniques in NDT, vol 3, June 1975. Verkooijen,J. "TOFD used to replace radiography" , INSIGHT, vol. 37(6), p 433-35, June 1995. Dr. A. Khalid , NDT markets: A brief review . NDT an Eastern-Western European Perspective, September 1998, page 16-19. Shaun Lawson, Ultrasonic testing and image processing for in progress weld inspection, Ultrasonic testing online Journal April 1996. N. Trimborn ; The TOFD technique, NDTnet, September 1997, vol-2, No. 9. INSIGHT vol 38 no.1 January 1996, "Estimates of the probability of detection of flaws in TOFD" by M.G. Silk. NDTnet-september 1997, vol 2 no.9, Bill Browne, TOFD-its limitations. NDTnet-september 1997, vol 2 no.9, Shaun Lawson, "High temperature TOFD scanning". M.G.Silk, B.H. Lidington " The potential of scattered or diffracted ultrasound in the determination of crack depth." NDT Journal, June 1975. INSIGHT vol.38 No.8 August 1996, p.549. INSIGHT vol.37 No.8 August 1995, p.581. INSIGHT vol.38 No.6 June 1996, p.391. NDTnet , January 1998, vol 4 No. 1. "The panel discussion of the Ultrasonic Session III". Hislop, J.P., " Flaw size evaluation in immersed ultrasonic testing." NDT vol.2, 1969 page 183. Krautkramer, J. " Determination of the size defects by the ultrsonic impulse method." British Journal Appl. Physic 10 , 1959 , page 240. Bottcher,B., Schulz, E. " A new method of crack determination in ultrasonic material testing". Proc 7th International Conference on NDT, Warsaw, 1973. Silk M. " The potential of scattered or diffracted ultrasound in the determination of crack depth. "NDT No. 8, 1975 page 146. Di Giacomo, Crisci, J.R. " An ultrasound method for measuring crack depth in structural weldments. Material evaluations 30, 1970, Page 189. J.P. Charles "Engineering applications of ultrasonic TOFD", Research studies press, 1989.
http://www.ndt.net/abstract/tofd0997.htm . 75 TOFD Abstracts were delivered by literature services.